I sowed a few tomato seeds this year. And miracle, of miracle, most of them grew. They grew slowly, mostly because it’s been colder than usual all year, but they grew. And now I have a LOT of tomatoes. I get my seeds from The Real Seed Company, which you should go visit if you have any interest in growing your own vegetables. They encourage you to save your seeds year on year, which if we all did, then they’d have no business. But mostly I don’t. And anyway, they have crazy unusual varieties of things, often from far flung parts of the world, and they have new seeds each year. I grew a Russian melon one year (I figured if it could grow in Russia it might just survive our Scottish summer) and this year I chose Grushovka and Urbikany bush tomatoes. The Urbikany comes from Siberia, and the Grushovka sounds like it’s of Russian extraction too. Anyway, so far I’ve picked 7.4kg of tomatoes, so I’ve been eating quite a lot of my favourite tomato salad: panzanella. It’s got that perfect balance of flavours and textures, and also uses up 2 or 3 day old sourdough bread (if any ever gets to be that age in our house!). I’ve been making my super tasty tomato sauce (to use on pasta) which I’ll share with you later. 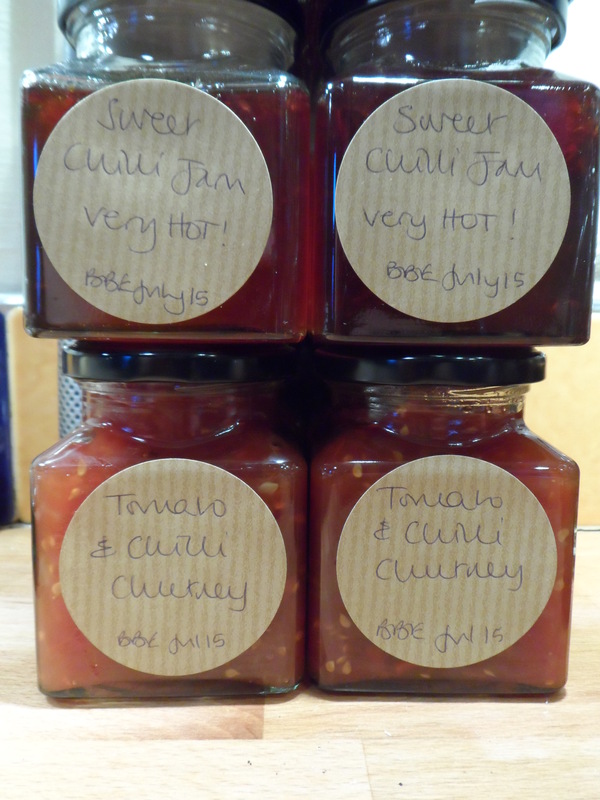 But for now… Another of my favourite tomato recipes is my hot tomato chutney. It’s super-easy to make and is the perfect accompaniment to cold meats or cheese. In fact when I’ve got a jar of it in the cupboard, it gets added to almost every sandwich, or salad platter. It’s just sweet enough, and just hot enough, with that lovely tang of sharpness too. Peel the tomatoes. You know how to do this, right? OK, here’s how I do it. With a wee sharp knife, just nick the skin of each tomato, you don’t need to go through all the flesh, just break the skin. Now put a full kettle on to boil, and pop some of the tomatoes into a big heatproof bowl. Pour the boiling water over the tomatoes. Leave them for a wee minute, and then, using a holy willie spoon (that’s a slotted spoon), take a tomato out, and using your fingers, peel/slip the skin off the tomato. Repeat. And repeat and repeat again until all the tomatoes are peeled. After you peel each tomato, roughly chop it straight into a large pan. It’s easiest just to do this while holding the tomato in your hand, over the pan, so you catch all the juice into the pot. Or chop them on a plate, so you catch all the juice and then just sloop the whole lot into the pan. Now, chop your onion, into small and even sized pieces and add this to the pot. Chop the chillies into teeny wee bits, and add them to the pan. If you only want a gentle heat, leave out the membrane and seeds, which are the super hot bits. Add the caster sugar and salt to the pot. Bring slowly to the boil, stirring as you go. Now simmer it for an hour and a half. Yes, an hour and a half. You should stir it occasionally, so it doesn’t stick to the bottom of the pan, but you don’t need to hover over it all the time. Go read a book. Or water your tomato plants. Or whatever. Bring it back to the boil and boil it, stirring occasionally, for 10 – 15 minutes. You’ll know it’s ready when you pull the spoon across the bottom of the pan, and it does a sort of “Moses Parting the Red Sea” thing, with the chutney ‘holding back’ and not immediately all slooping back into the base of the pan. You might not understand what I mean until you see your chutney doing it. But really, this is the best test I know for readiness of this chutney. If you weren’t simmering it on a hot enough heat earlier, this stage will take way longer than 15 minutes, which is fine. Just make sure it boils down enough to get that glossy look, and to ‘part the Red Sea’ or it will end up too runny and a bit rubbish. And that’s it. It’s ready to pop into sterilised jars. You’ll probably fill about four 350ml jars, and it will keep for around 4 months. It might keep for longer, but I’ve never had any last that long. And, if like me, you have a glut of tomatoes, make lots of this. And tie pretty fabric squares to the pot lids, with a ribbon, and there you have your first homemade Christmas presents of the season. 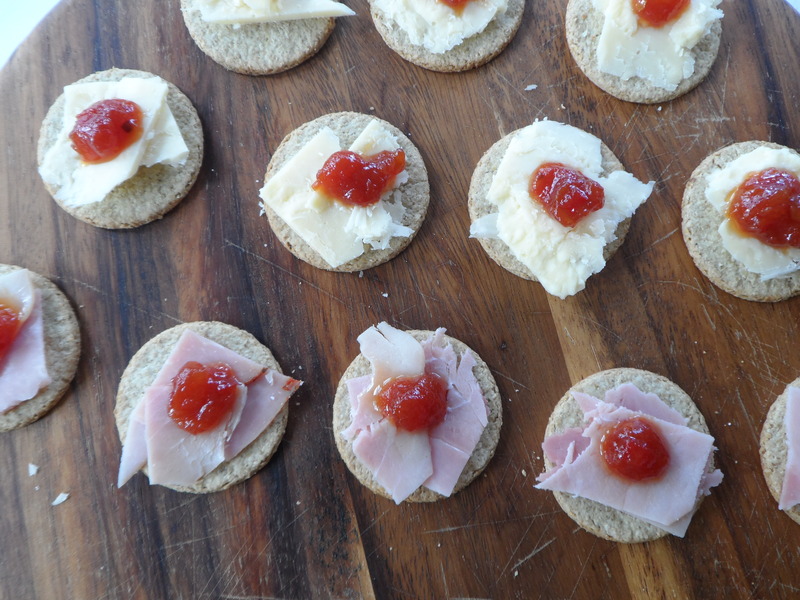 Mini oatcakes with cheese & chutney or ham & chutney. You choose.